Round Pond Winery desired a monument sign that created immediate visual impact. Round Pond Winery desired a monument sign that created immediate visual impact. The use of masonry and a custom forged plaque elegantly accomplished this goal. Twin Peaks Townhomes desired a sign with presence. Twin Peaks Townhomes desired a sign with presence. This stucco finished monument sign with aluminum dimensional letters answered that need. 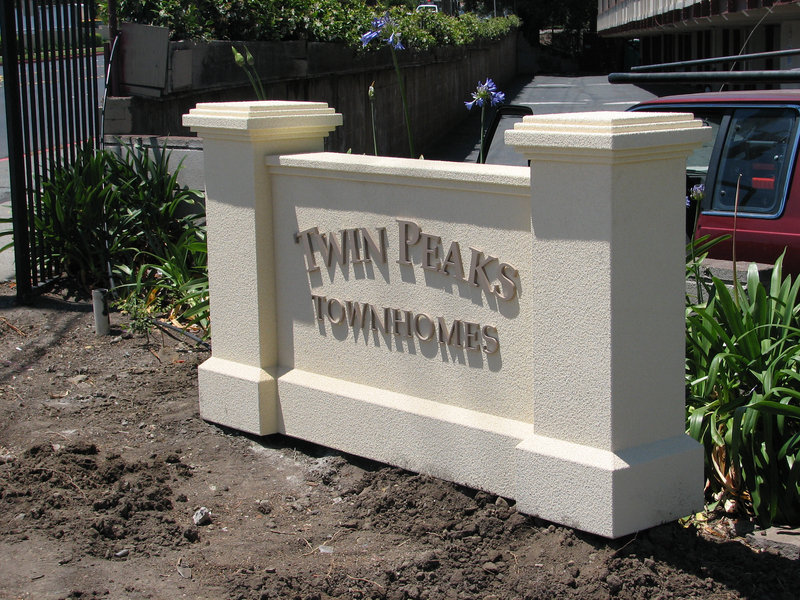 Twin Peaks Townhomes desired a sign with presence. We color-matched the "masonic blue" color reinforced the brand of the Castro Valley Masonic Center. 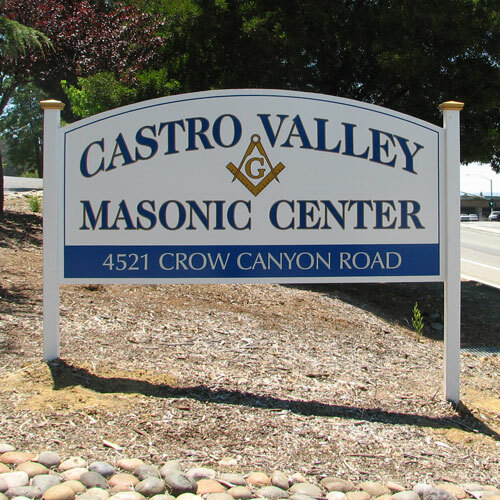 The Castro Valley Masonic Center sign was constructed from resin impregnated plywood, vinyl lettering and vinyl logo. We color-matched the "masonic blue" color reinforced their brand! 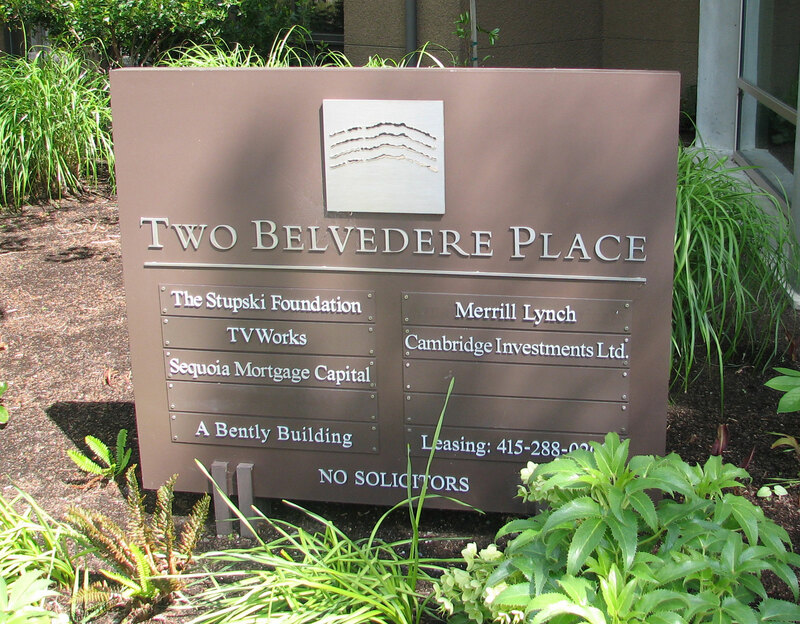 An example of a monument sign that also serves as a wayfinding tool for clients. Constructed out of resin impregnated plywood, durable exterior sign paint, and vinyl lettering. This directory monument sign clearly guides the way for clients at this multi unit office building. Blackstone Winery wanted a monument with a rustic and defined presence. 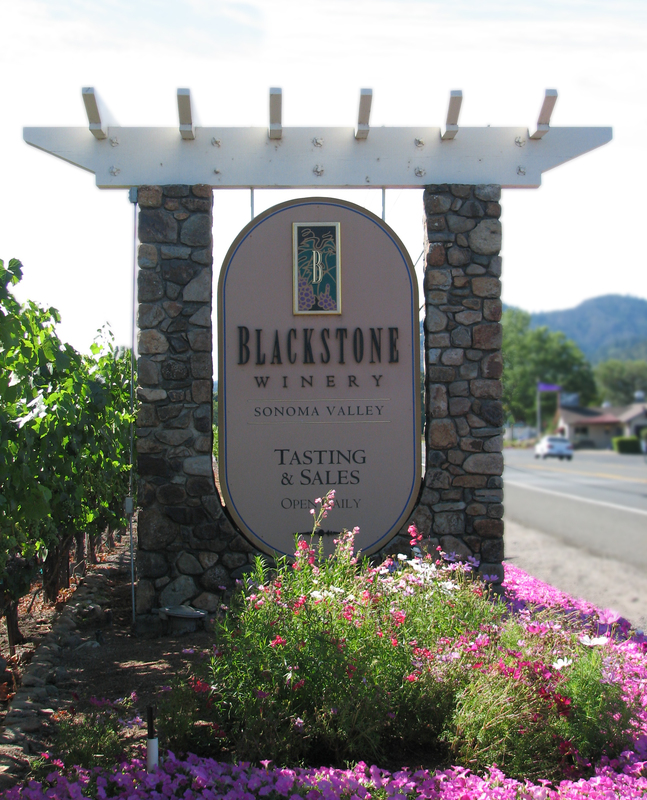 Blackstone Winery wanted a monument with a rustic and defined presence. We answered that call with custom masonry, rustic beams and a sign that featured color match paint, gold leaf, dimensional letters and a recreation of their logo artwork. 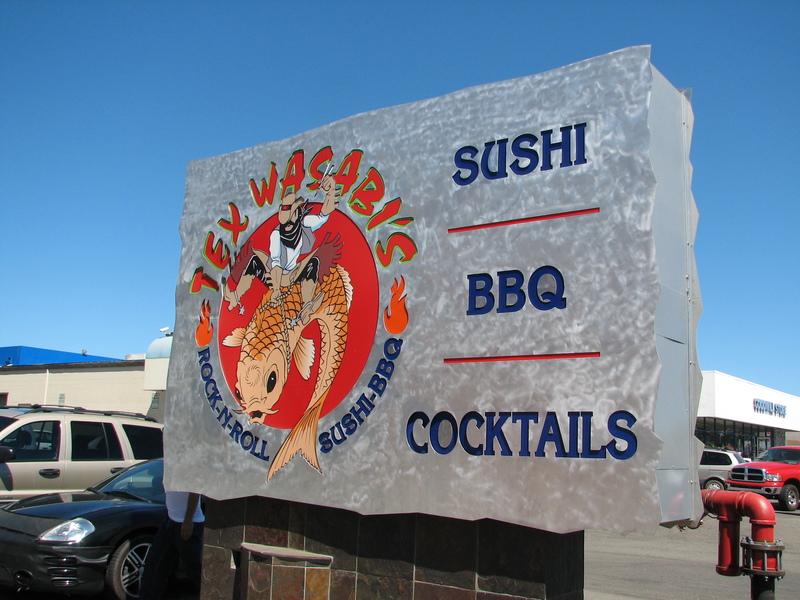 Tex Wasabi's Rock-N-Roll Sushi BBQ desired a sign that made a bold statement. Tex Wasabi's Rock-N-Roll Sushi BBQ desired a sign that made a bold statement. We delivered on this request with water-jetted distressed aluminum, custom digital graphics and backlighting. The Aquatic Park Center wanted to mimic the buildings architecture with a brick facade and clearly guide customers to many business housed their. 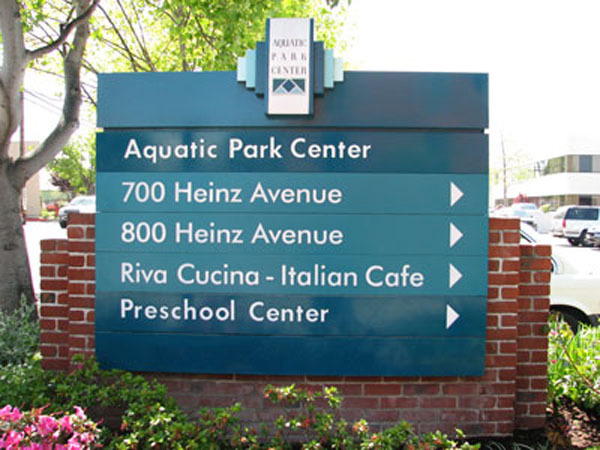 The Aquatic Park Center, a large mix use industrial property in Berkeley wanted their monument signs to mimic the buildings architecture with a brick facade and clearly guide customers to many business housed their. This is a classic sandblasted monument sign that incorporates the beauty of wood and the elegance of dimensional letters. This monument sign incorporates and aluminum slab substrate, dimensional graphics & lettering and individual tenant plaques that can easily be updated with matching vinyl lettering. This affordable monument was created out of resin impregnated plywood and custom vinyl graphics and lettering. 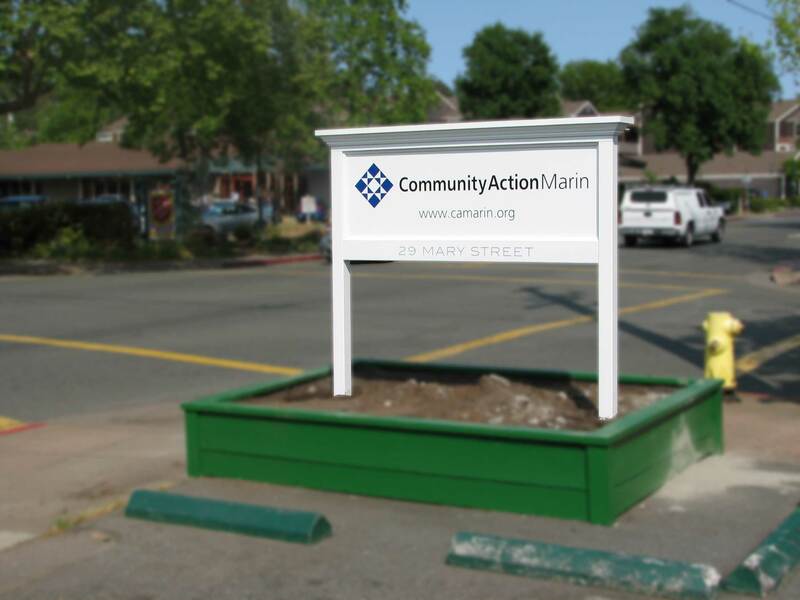 Community Action Marin's monument sign makes an elegant and clear statement with the use of crisp vinyl graphics and elegant trim and moulding. Dramatically increase your business’s exposure and strengthen your corporate identity with the professional elegance of monument signs from Insight Signs & Graphics. Using a wide range of materials, colors and creative design elements, we will build a monument sign that not only promotes your business, but also becomes a vital link in your marketing efforts. 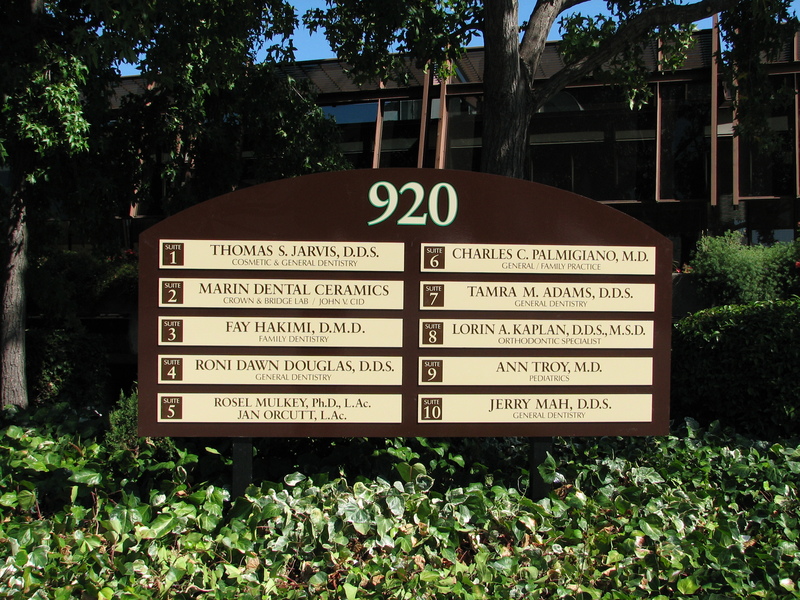 Make a timeless statement today with a new monument sign, give us a call at 707-887-1303 or contact us today to request a no obligation estimate.